For some baking can be a bit of black art, indeed I was in the "I can't bake" camp for quite a while. Many feel that it is too tedious, or too hard. I grant you that it does take some practice and some patience but once you have mastered it you won't go back. Just to give you some extra incentive, next time you are in the super market picking up a loaf of sliced white (or even some of that wholewheat designer bread) take a look at the ingredients. Baked goods is one of main places where the food labs have been having a field day. Baked goods are full of all sorts of additives and chemicals. Bread is quite basic and has the following ingredients; Flour, Water, Yeast, Salt, and optionally some oil. If your loaf has more in it then you have some modified version of bread. If you are dead against trying to bake your own It is worth searching around for a good baker who produces their own bread on site. Artisan bread can also be found at many farmers markets also but beware of baked good listed as artisan in supermarkets (even wholefoods) read the labels! Your other option is a bread machine, I started with one of these and you can pick one up at a reasonable price. They are simple to use and provide a great introduction to bread making. You still control what goes in your bread and I you will produce a much better loaf than you can buy. I believe this recipe originates from Scotland. You need your Mug, a bowl and a baking tin (I used a medium loaf tin). Take your Mug and fill it with Bran (oat or wheat) and pour into the bowl, fill the same mug with Sugar (I use raw brown sugar but it doesn't matter) and pour into bowl. Fill the mug again with dried fruit, any combination you like or have available. Mix and match, experiment and have fun. Pour this into the bowl along with a Mug of milk. Give it a stir and leave to soak at least 4 hours. I sometimes leave over night, or put it together in the morning and complete when I come home from work. After the mix has been soaking add a mug full of self rising flour. This might be hard to get hold of in the US but it really just a regular white flour and baking powder. I make my own (because I know it is fresh then) from stone ground white flour at a ratio of 4% baking powder to flour (100g of flour, means 4g of baking powder) in my mug this means about 1 teaspoon. Pour in your mug of self rising flour and stir to combine. Pour into your baking tin and place in a medium oven (350 deg F) a leave for at least 45 mins it can take well over an hour to cook, to test if it is cook simply press the top with your finger when it is firm (pushes back) you can pull the loaf out. Allow to cool then serve sliced with or without butter. This loaf will a week in a sealed container, but it problem will be gone quite quickly. 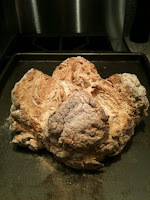 If you have no time to make yeast leavened bread then a great quick standby is Soda Bread. Soda bread is great with soups and stews or with a hunk of cheese and beer. It is simple to make and doesn't take much time. Combine dry ingredients in a bowl, then add the wet and mix with your fingers to make a dough (should be quite wet if not add more liquid) don't over mix. Turn out onto cookie sheet and form into a round dust with flour and then cut a deep cross. Place in the oven and bake for 20-20mins. This bread is best eaten warm with lashings of butter. 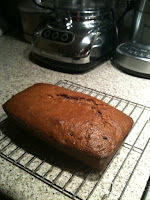 The following recipe is the one I use for my daily bread, well I make it over 2 days or so. This recipe will work with either white or wholewheat flour. Making good bread is all about technique and that is quite an involved subject which would be impossible to cover here and I think this is something that needs to be experienced visually and youtube is a great resource. I floundered for a while not able to achieve consistent results and producing my fair share of hockey pucks as well as decent bread until I encounter a book by Daniel Stevens who is the baker for River Cottage, his techniques helped me to produce a consistent loaf of bread (see Dan on Youtube). Baking bread is done in three stages. The first stage creates the sponge where the yeast is cultivated for this particular loaf it is optional but I always do it. Mix together half of the flour with all of the water and the yeast in a bowl. This will create a very wet sloppy dough. Cover the bowl and leave overnight to ferment. Phase two is about kneading and proving the dough ready for baking. During the night the yeast will multiply and feed on the flour and in the morning the sponge should be formed, the mixture having risen and be frothy and light. Now add the rest of the flour along with the salt and the oil. Bring together into a sticky dough. At this point a stand mixer with a dough hook is a good idea but for those without or if you want to work those muscles then hand kneading can be done (look on youtube for technique) kneading must be done for at least 15 mins longer won't hurt. Once done the dough will loose it's initial stickiness and become stretchy as the gluten formed by the kneading binds the dough. Form kneaded dough into a ball and place in an oiled bowl which has room for the bread to double in size. Cover and leave on the counter until it has doubled in size, or you can put it in the fridge go off to work and leave it rising slowly throughout the day. The final phase is shaping and baking. Take your risen dough and press it down knocking all the breath out of it. Turn it out onto a flat surface and shape ready for baking, place in tin if using or free form, leave to rise for an hour (2 if you brought the dough out of the fridge). 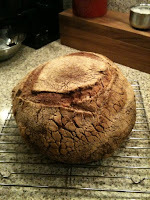 If you are shaping a free form loaf then place it on a baking try. Then bring your oven up to it maximum temperature. I use a pizza stone in my oven as a baking surface but you can use a traditional baking tin. Once the oven is up to temperature, put your risen loaf in the oven and bake for 10 mins. You should cut slashes in the top of your loaf before putting it in the oven since that helps it to expand without bursting. A bread knife does a good job at slashing the bread. After 10 mins reduce the oven to 400 deg F and cook for a further 30mins. After that time remove and cool on a rack. If you are using a tin turn the bread out as soon as you can so that it doesn't sweat. So making bread isn't for everyone, it is involved and when mastered very satisfying and it opens a whole new world to you. Donuts anyone.....well that is another post..